The European Alps form a natural border. Whichever way you turn military history, both ancient and modern, casts a shadow across the landscape. 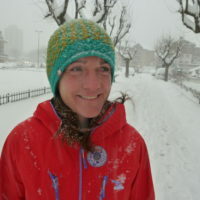 As a former army officer now working full time as a Mountain Guide in the Alps, Tania Noakes’ fascination with it has deepened. 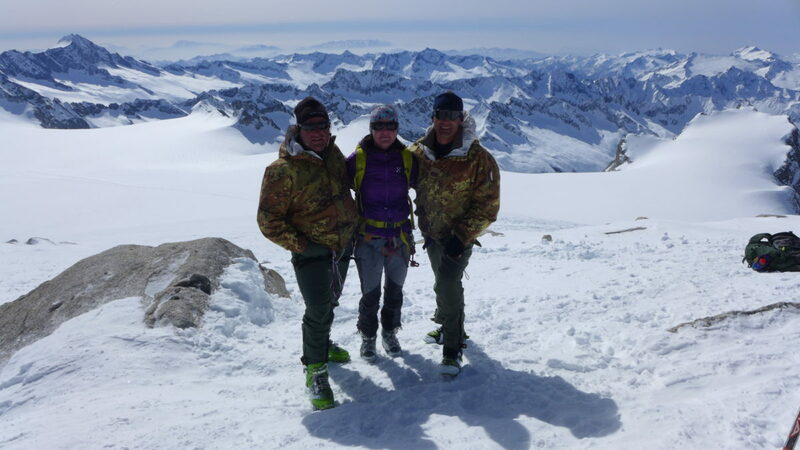 With the centenary anniversary of the outbreak of World War 1 in mind, Tania led a group from Oxford University Officer Training Corps for a week of ski-touring during April along this former front-line in the Adamello and Ortler mountain ranges of Italy. 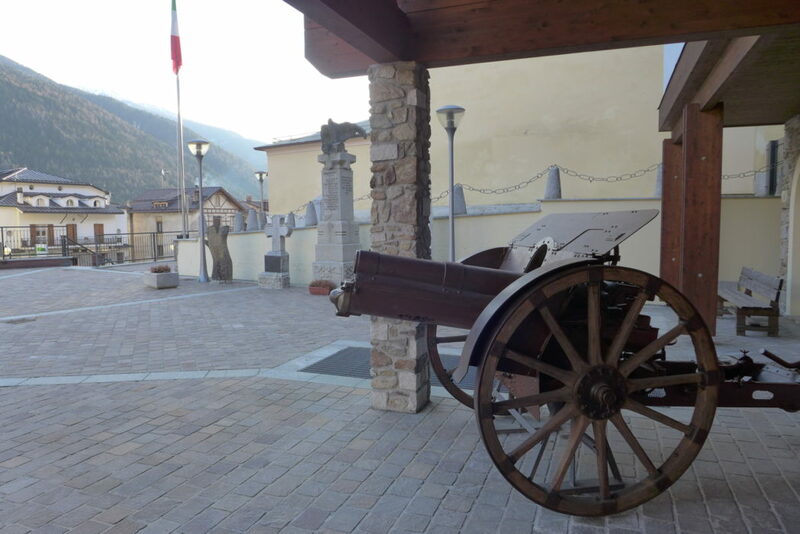 Their aim was to get a feel for what went on here during the famous ‘White War’ of the Italian front in WW1, visit significant historic sites and enjoy some amazing skiing along the way. 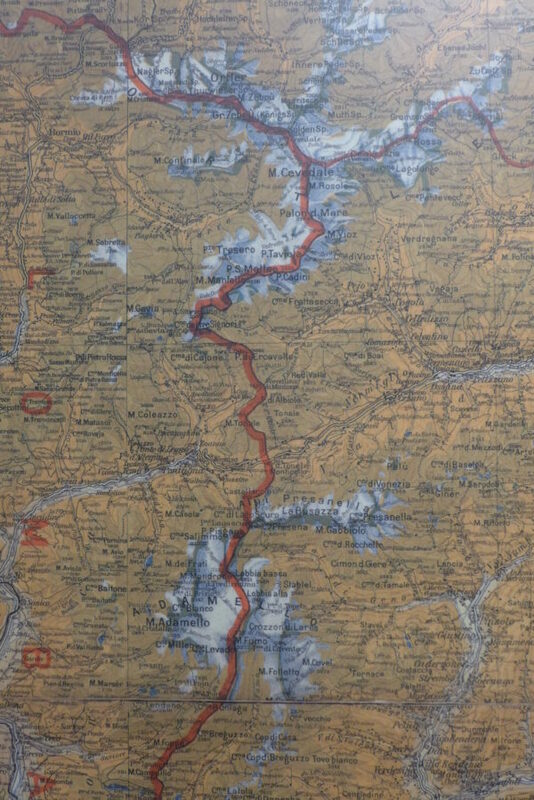 The WW1 frontline runs along the modern-day boundary between Lombardy and Trentino which are separated by the Tonale pass. Nowadays Passo del Tonale is known as an excellent ski area which accesses some big off-piste descents. 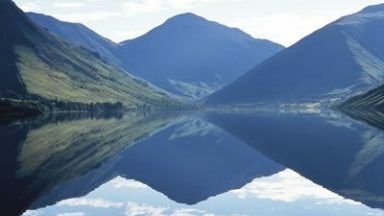 In 1915 the pass was a silent no-man’s land and control of it was a strategic aim for both sides. The most obvious reminder of this bitter conflict here is the imposing ossuary built by Mussolini in 1936 to remember local men who fell in WW1. Most of the bones housed here are from casualties caused by a single Austrian attack on the Tonale Pass in 1918 codenamed ‘Lawine’ (avalanche). This was a diversion from their main offensive on the Asiago plateau and across the river Piave. It would prove Austria’s final offensive on this front and it would fail. 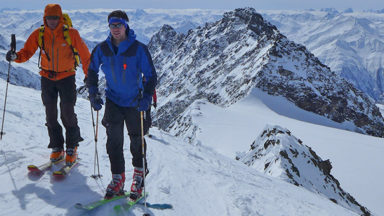 After a day skiing the piste and refreshing essential touring skills we were ready for our three day ski-tour. Using gondola that links Passo del Tonale to Passo Paradiso and then the chair and drag lift you can get within a 50m boot pack of Passo Presanella and entry to the vast Adamello back-country. The view south from here takes in the fairly flat and wide glacial bowl of the Adamello glacier. A couple of hundred meters further west is Moroccaro pass, which witnessed the first major skirmish of WW1 on this section of the front. The main objective for the Italians was to break the Austrian stronghold of Monticelli and gain free access to the Tonale Pass. The pass was so well defended that the Italians were forced to try and outflank it to the south across the Adamello glacier. On 9 June 1915 the Italians approached via this glacial plateau with the aim of taking the Austrian posts of Conca Presena and the Paradiso Pass from behind. When Italian troops appeared at Maroccaro pass they met with fierce resistance and artillery bombardment from the Fort at Saccarana in the valley below. They were forced to retreat with severe losses, 52 killed and 87 wounded. Both mules and dog-teams were used to help with the work effort. 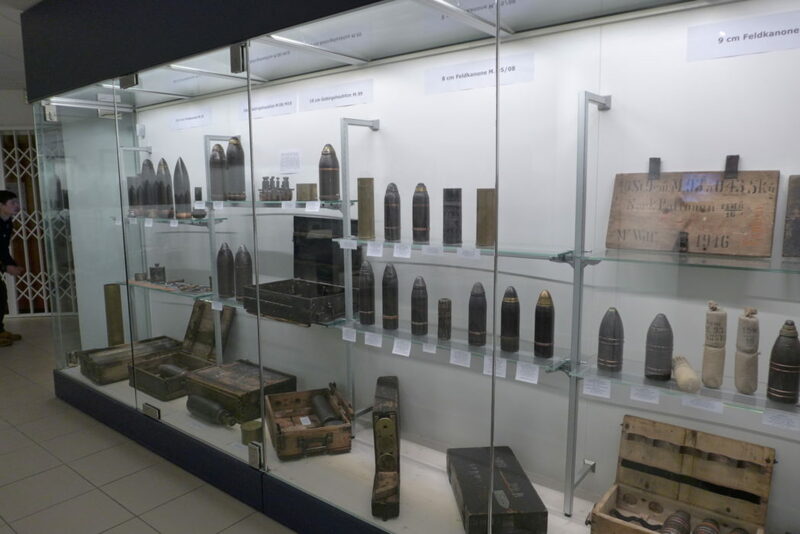 The White War museum at Temu shows just how inventive troops had to be to survive and fight in this hostile environment. At that time much less was known about the harmful effects of UV radiation at altitude. Mules were given green-tinted goggles to prevent them from going snow-blind which caused them to mistake snow for grass and eat it, resulting in intestinal and stomach problems. 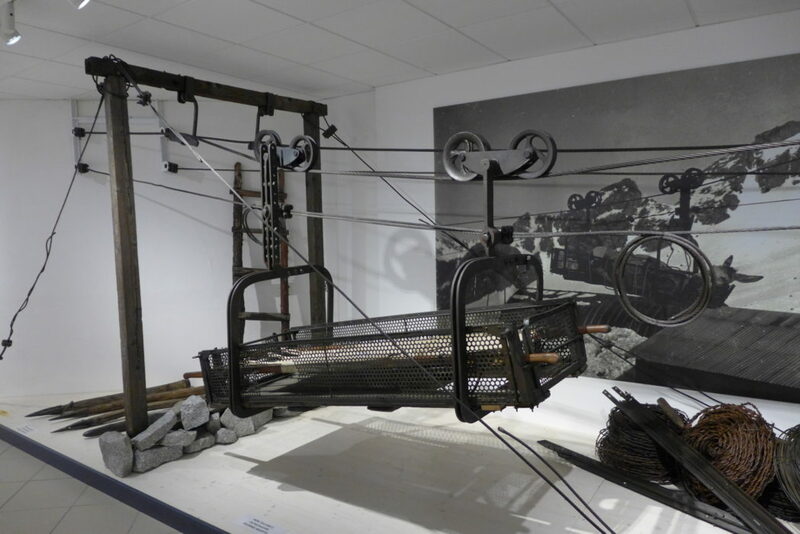 To ensure that the dog-teams could resupply outposts efficiently and not get bogged down in deep snow a heavily weighted and specifically adapted sledge was used with a roller heated by hot coals to press a firm ‘snow-road’ into the glacier. From Presanella pass we skied down to Lago Scura (dark lake), past the Refuge Mandrone and across the Vedretta Mandrone south towards the Refuge Caduti I Adamello where we planned to stay for two nights. The name of the Refuge itself means ‘Refuge of the Fallen of the Adamello’ although today it also goes by the name of Refugio Lobbia. The rocky ridge where the refuge is sited was taken by the Italians on 12 April 1916, but the second phase of their offensive on 29 April 1916 which aimed to take well-equipped Austrian lines on the Eastern edge of the glacier encountered fierce resistance. Italian troops in their khaki uniforms attacking on skis across the immaculate whiteness of the glacier were clear targets in their khaki uniforms and the result was carnage. as we skin up from the refuge towards ‘Cresta Croce’, an isolated ridge to the south, perched high above the Adamello glacier. Here a 149mm cannon remains in place today. From the refuge a short tour along the eastern flank of the ridge brings you to a small notch south of its emplacement. The final section, through the notch and along the Cresta Croce ridge is best climbed on foot; past rusting spirals of barbed wire abandoned in place years ago. From the cannon a short north-facing descent gains the main Adamello glacier. After traversing its wide expanse you can reach the Passo Venezia and access to 2km vertical of north-facing descent to Ponte di Legno. 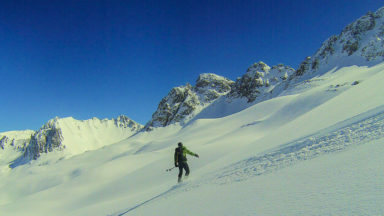 There are so many great ski lines in this one immense valley that you are sure to get fresh tracks even a week after the last snowfall. Speaking of snowfall… the winter of 1916–17 had the greatest snowfall ever recorded in this region – over ten metres – including four metres over two days in December. Such severe conditions effectively put a halt to military activity with the battle becoming one for survival. Men on both sides were lost to daily to the ‘white death’ (avalanche). In the ensuing days after this great storm, an estimated 9,000 to 10,000 soldiers perished in avalanches across the Italian front. Transport columns, armed patrols and remote observation posts simply disappeared, swept into crevasses or over cliffs. 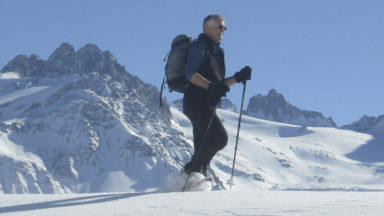 Their remains are still being found in the Alps today. After another night in Temu and a visit to the museum we headed further north along the former front into the Ortler. This section of the front saw less fighting. 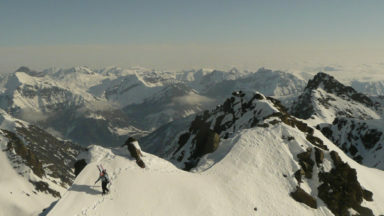 The front’s northerly extremity at the Stelviojoch, the tri-nation border with Switzerland, was very quiet. Both combative sides were concerned about stray shells landing on the wrong side of the border in neutral Switzerland and causing a diplomatic incident. Our route through the Ortler tried to keep close to the front where terrain allowed. 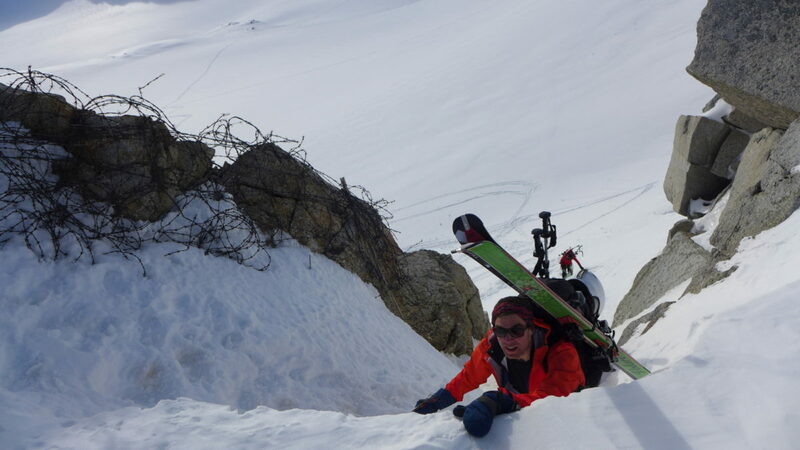 This area is famous for hospitable huts and good ski descents and as a result it can be a little busy in peak ski touring season. 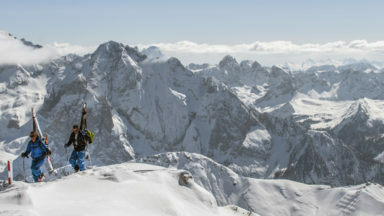 We traversed over the broad summit ridge of Palon de la Mare and on to Monte Cevedale before dropping south of the former front-line which sweeps west over the steep, precipitous summits of the Konig-Spitz and Monte Zebru. 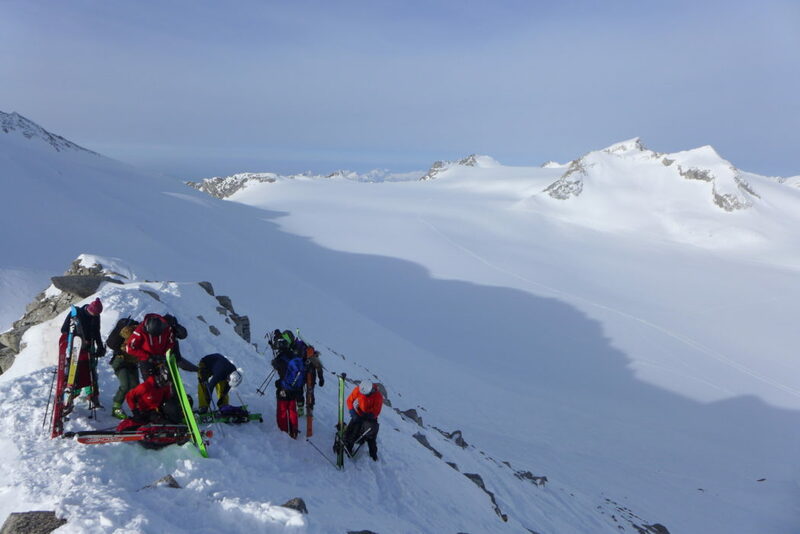 A logical, and varied final day linking the hanging glaciers on the southern flank of this beautiful mountain chain gains you the Tuckett pass and access to the Stelviojoch. A small, hollow shell of a building, half filled with snow still stands at this isolated col. From here you look down into what once was Austria and is now the Italian province of Trentino. WW1 broke Europe apart. It changed frontiers; slaughtered millions; forged and destroyed nations. It ploughed the ground for the seeds of fascism to take root with the prospect of even greater bloodshed only decades later; and it played out centre stage, here, in Europe. For most of my generation the idea of Europe thrown into such turmoil is inconceivable. Yet if we fan the flames of intolerance and fail to remember the true cost of war is it really so improbable that we might face some kind of fallout?